A Real Força Aérea da Holanda (RNLAF) começou a usar uma mistura de 5% de um biocombustível sustentável produzido para a aviação (SAF) fornecido pelas empresas SkyNRG e Shell Aviation. O sucesso dos testes realizados em meados de 2018 levou o Ministério da Defesa holandês a tomar a decisão, numa aposta para reduzir o impacto ambiental criado pela aviação militar. O biocombustível proporciona reduções na emissão de CO2 da ordem de 60%-80%. The transition to sustainable aviation is of key importance for the Royal Netherlands Air Force. In 2010 we performed the first demonstration flight with an Apache helicopter on biofuel. We now want to work towards structurally operating all our aircraft on SAF from all our locations. The current flights on SAF from Leeuwarden Airbase are an important step in this. O SAF utilizado pelos F-16 Fighting Falcon é produzido pela World Energy em sua planta na região de Paramount, Califórnia, e é derivado de óleo de cozinha utilizado - used cooking oil (UCO). The SAF supplied in Leeuwarden is enough for the first half of 2019. 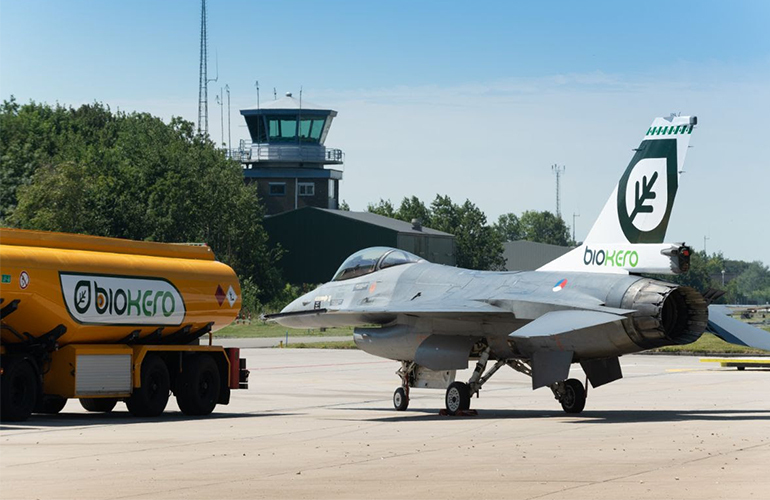 In the coming years, the Royal Netherlands Air Force aims to gradually increase the blend percentage and eventually operate all aircraft on SAF. In 2030, the Air Force wants to reduce dependency on fossil fuels with twenty percent, and in 2050 with no less than seventy percent.